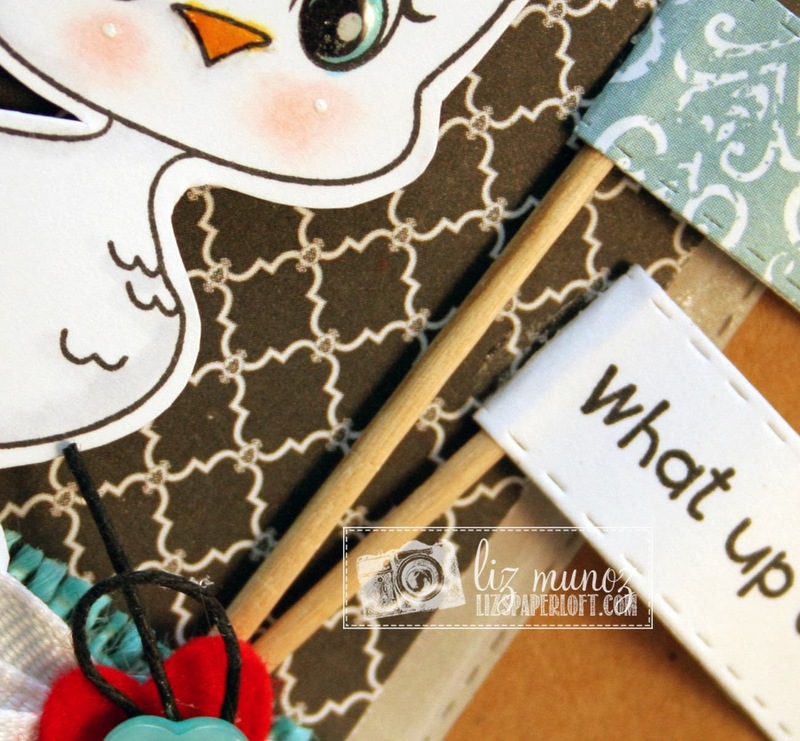 Liz's Paper Loft: PKS March Reveal Blog Hop ~ What's Up! Welcome to Peachy Keen Stamps March Reveal Blog Hop! We’ve made it through another fabulous round of sneak peeks, and the time has come to reveal the NEW STAMPS! This release has been so much fun to work with and it’s been all we could do to hold back from sharing every single set in it’s entirety!Squeal with delight, INDEED, because this release is filled with sweetness and some of the most adorable images EVER!! If you arrived here from Brigit's Blog, then you're in the right place. If you just popped in to see me, then be sure to head over to Peachy Keen's blog for the start...You will NOT want to miss a thing! Let’s start off with PKSC-27 March 2014 Stamp of the Month Kit. We think this release is so CUTE and F-U-N, and we know you will too!! I'm just crazy for this lil' chick! A little glossy accents make the eyes come alive! At the bottom of this post, you will find the complete blog hop order should you happen to get lost along the way, you can always pop back here and pick up where you left off. How would you like the chance to add to your Peachy Keen Stamps collection? We’re going to give away two $25 Gift Certificates as a special “Thank You” for hopping with us today. All you need to do is leave a comment on here on this blog post, AND on our designer’s blogs. We don’t know which designer will be selecting the winner, so to increase your chances of winning, make sure to leave a comment on each stop on this hop. We’ll give you plenty of time as we’ll accept comments until Midnight on Sunday, March 9th and we’ll announce the winners here on Monday March 10th! Good luck and Happy Hopping!! The newest kit will be available for purchase and new members today, March 5th. Love your tag, so cute! that gift tag is too adorable! I'd be excited to receive a gift bag like that!!! Love your tag! Love the design and the layout of your tag. Wonderful! That is THE cutest Tag ever! I love the colored burlap and the pennants!The chicken wire type paper adds so much too! Peep Peep means I love your style Liz! and Thanks for sharing! It's perfect Liz! I love the color combo and all your fun little details! Love Love Love this tag!!!!! Super Awesome job!!! Just love your adorable tag!! What a great way to add a little whimsy to a gift. Adorable! Fantastic gift tag! Love the flags and the chick! Love the little signs on the tag! So cute! Your little tag is just too cute!! Love the colors and textures you've used!! Plus, that chick is so darling!! Beautiful work!! This is such an adorable tag Liz!!! That chickie is soooooo CUTE!!! Super cute tag and like all the sweet details. OMG!! This is Simply ADORABLE!! What a SWEET tag!! Oh my word this is ADORABLE Liz! I LOVE this chickie and cant wait to buy it! Okay all your details are simply AMAZING!! LVOE the color pallet too! BEAUTIFULLY done as always! Such a cute tag, gr8t job! 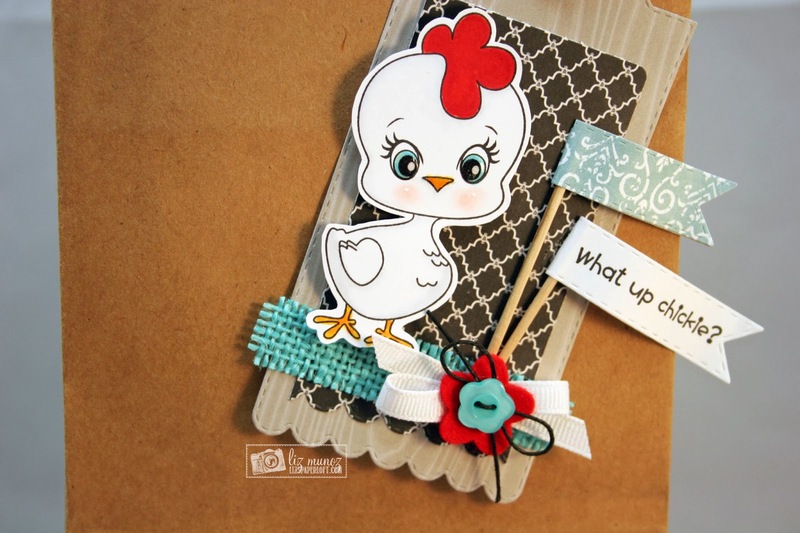 I LOVE your cute chickie tag. 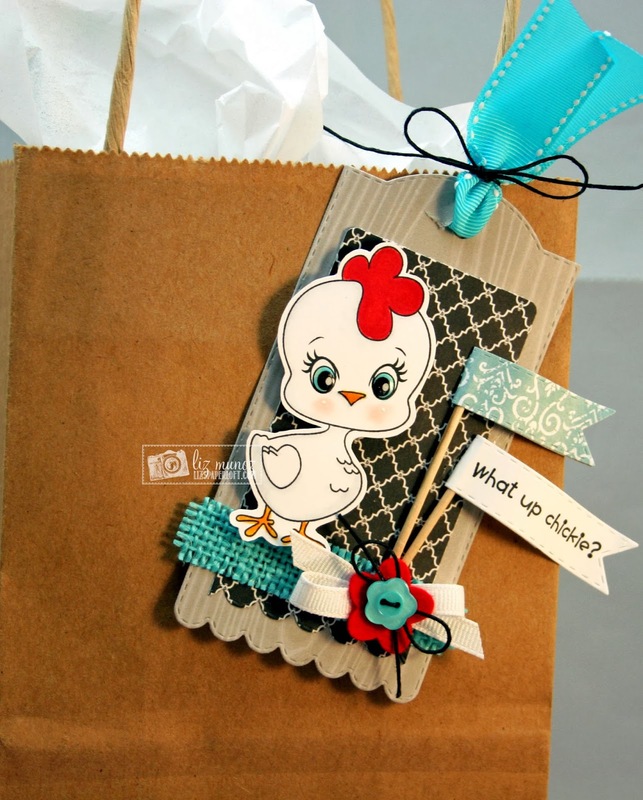 I love the paper background you used as well as the blue burlap. It really ties the image together. 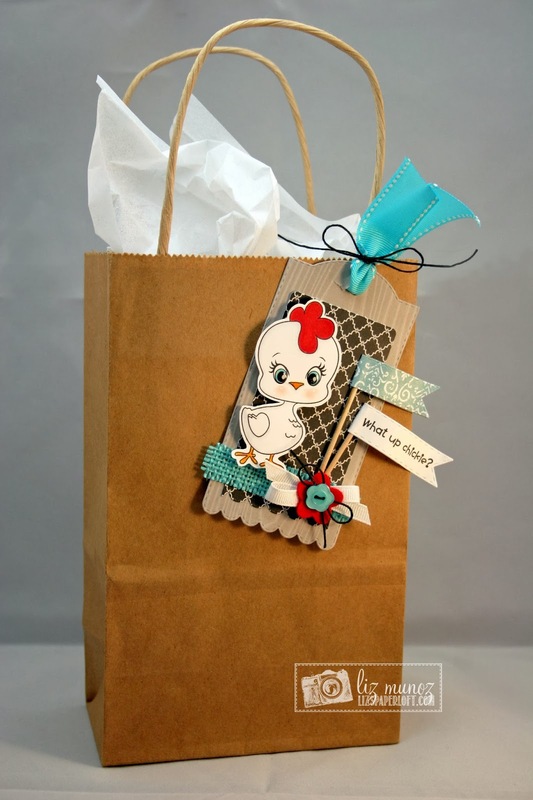 Very cute gift bag for Spring! Love your tag!! This is too adorable!! :) Great colors too!! ahhhh such a cute little tag!!!! Just love that little chick! This gift tag is so cute!! Love that CUTE tag!!! :) What a great idea to turn those labels into little flags and I love that flower cluster! Love this tag, beautifully done! !